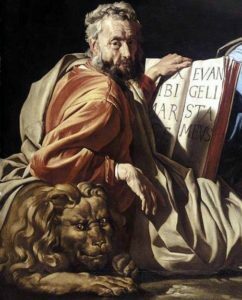 Today is the Feast Day of St. Mark, Evangelist. Mark was the author of the second Gospel, which he composed, according to some Early Church Fathers, when the Christians in Rome asked him to write down the preaching of the apostle Peter. Therefore Mark’s Gospel is also sometimes known as Peter’s Gospel. Mark, also known as John Mark, was originally from Jerusalem, where the house of his mother Mary was the center of the early Jerusalem Church (Acts 12:12). He was brought from Jerusalem by Paul and Barnabas to Antioch (Acts 12:25), and it was from this city that they set out on the first missionary journey. When Paul and Barnabas were preparing to go on the second missionary journey, Barnabas wanted to take Mark with them again, but Paul refused because Mark had left them during the first journey. Theories abound as to why Mark left, but the Scriptures are silent. Barnabas, whose name means “son of encouragement,” was unwilling to give up on Mark so he and Paul split company. Barnabas took Mark with him and went to Cyprus, while Paul took Silas as his new companion (Acts 15:37-40). As it turns out, Barnabas was right. Later, Paul reconciled with Mark and was working with him again (Colossians 4:10; Philemon 24; 2 Timothy 4:11). Finally, Mark was found laboring with Peter in Rome (1 Peter 5:13). Tradition says that Mark was instrumental in founding the Church in Alexandria, becoming its first bishop, and also that he suffered a martyr’s death. Mark’s Gospel is short, but it includes many little details that are not in the other Gospels. The Gospel starts out with John the Baptist in the wilderness preaching a baptism for the repentance of sin. Mark tells us that this was in fulfillment of Malachi 3:1. This quick start reflects the nature of Mark’s Gospel, which is very fast-paced. Mark’s Gospel, and Mark himself, is sometimes symbolized as a winged lion. This symbolism is taken from Ezekiel 1 and Revelation 4. The association may be because the Gospel starts with John the Baptist boldly preaching in the wilderness much like a roaring lion. It is also observed that lions are fearless. St. Mark wrote a Gospel to a church which was suffering from frequent martyrdom, in Rome. Mark wrote with a fearless faith in Jesus as the Son of God. According to tradition he was buried in Alexandria. This city was conquered in 641 by the advancing Islamic military. In 828, two Venetian merchants stole the remains of Mark and transported them to Venice, where a basilica was built to house them. Prayer: O Almighty God, as You have enriched Your Church with the precious Gospel proclaimed by the evangelist Saint Mark, grant us firmly to believe Your glad tidings of salvation and daily walk according to Your Word, through Jesus Christ, Your Son, our Lord, who lives and reigns with You and the Holy Spirit, one God, now and forever. Amen.